Rdio | Flickr - Photo Sharing! Finally we get to share the Mac App that has being changing the way I enjoy music. Despite the fact that it utilizes the Adobe Flash plugin to play music within the app, for the most part, the entire experience is html-driven and is seamless with your browser experience as well. 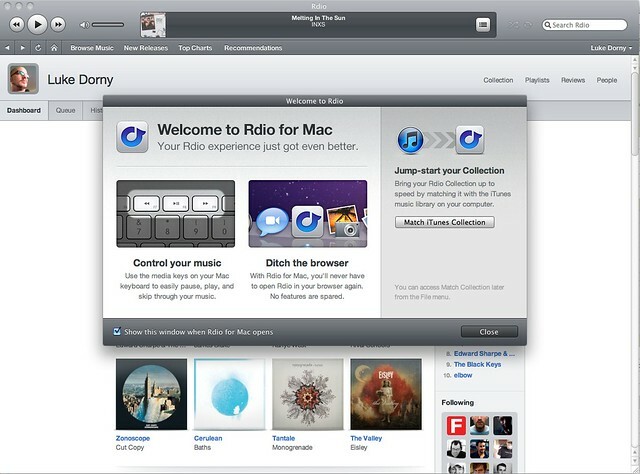 I'm a very big fan of RDIO and am seriously enjoying the now available Mac App. Change the way you think about music: Access vs Ownership. I don't worry about proper album artwork quality, bitrates of files, file corruption, lost files, duplicate files, or anything else now. I've spent countless dollars on music in my lifetime, so $5 a month for access to an increasing library of tunes is a goldmine to me. Now if only they'd accept UK credit cards. Funny how Spotify allows US cards I believe.